Before outlining the bruxism symptoms, let’s first define bruxism. While bruxism, teeth grinding and jaw clenching are generally considered the same thing (and used interchangedly at times), clenching can occur without the side-to-side movement of grinding. You may find yourself clenching during the day but grinding at night. For our purposes, we’ll consider the three as the same thing. Tension headaches are usually the result of the constant and forceful contraction of the facial muscles, causing muscle strain and fatigue. If you place your hand on your temporalis muscle (side of head above the jaw) and the masseter muscle (chewing muscle) and clench a bit, you can feel these muscle contract. As with headaches, clenching your jaw muscles can result in tightness in the morning. Your jaw may be stiff. Moving your jaw side to side or even opening your mouth may be harder in the morning. It’s as if you need to warm them up to get them moving correctly. When your teeth grind against each other in a back and forth manner, the surface of the teeth (whether natural, filled or crowned) can wear down. You may notice that your bottom incisors are no longer pointy. If the enamel on our teeth is worn down from grinding, your teeth can become sensitive. The extreme pressure generated by clenching and grinding can wear down the gums, which can lead to loose teeth. While the sound of your teeth grating on each other may not wake you up, it may wake your partner or roommate up. When we’re anxious or under stress we tend to clench our jaw. During the day we can consciously stop this clenching, but at night we can’t. An ‘off’ bite can be caused by injury, dental work, missing teeth etc. The result: your teeth do not align in a way that allows your jaw joint to be in it’s most relaxed and natural position. When I’m angry, I tend to clench my jaw. If someone has unexpressed anger it would make sense that they too clench their jaw. A study by Drs. Bostwick and Jaffe1 found that some people start grinding after starting on anti-depressants. When their doctor changed to a different anti-depressant medication, the grinding stopped. If that has happened to you, check with your doctor. While some researchers think stress may cause teeth grinding, others wonder if it could be the result of it. Does A cause B or does B cause A? 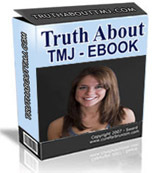 The Truth About TMJ ebook package by Dr Spainhower, a TMJ dentist, teaches bruxism and TMJ sufferers what they need to know to determine the source of their problem and relief their pain and symptoms all in the comfort of their home. StopJawClenching.com is for informational purposes only and does not provide medical, dental, or nutritional advice, diagnosis or treatment. © 2010-2018 • All Rights Reserved.